"On the 22nd Fagan's Division of Price's Army was defending against the advance of Union Gen. Pleasonton from the east. Two of Fagan's Brigades were driven from the Little Blue River to the eastern edge of town. The Union attack was made first from the NE with Philips' Brigade and the Second Arkansas (Union) both on foot. McNeil's Brigade then charged through town mounted. Cabell's Brigade came up to stop the Union advance. He was driven back and many of his men were surrounded. Near this spot two of his guns were captured and he barely escaped." Directions to Historical Marker E: Head south on Main Street for 2 blocks and turn right (west) on Lexington Avenue. After about 0.6 miles turn left (south) on River Boulevard. The marker is on the east side of the street in front of the Independence Temple of the Community of Christ. You should be able to park on River Boulevard. 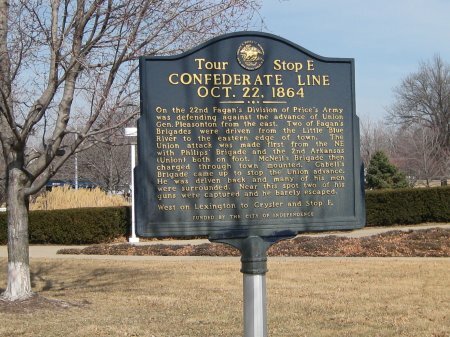 This tour stop is located near Independence, Missouri 64050. Description: Now the Confederates had Independence to themselves. But Price's army was in a precarious position. Waiting ahead of him on the Big Blue River to the west was the Federal Army of the Border. Pursuing him from behind him was Major General Alfred S. Pleasonton's Provisional Cavalry Division from the Army of the Department of Missouri. Also pursuing him from behind was a detachment of infantry commanded by Major General A. J. Smith from the 16th Army Corps. Price knew he needed to cross the Big Blue and defeat Curtis' army before Pleasonton or Smith could catch up and join forces with Curtis. He also needed to get his wagon train over the river. So Price sent Shelby's and Fagan's Divisions west against the Union Army of the Border. Marmaduke's Division would hold against Pleasonton until the Army of the Border was defeated. He left Cabell's Brigade from Fagan's Division to get the wagon train southwest to Little Santa Fe. On October 22nd, Pleasonton's Cavalry Division crossed the Little Blue River and headed for Independence. Brigadier General John McNeil's Second Brigade was in the lead as they approached Independence. They soon met up with Fagan's rear guard (Cabell's and Slemon's Brigades) lined up across the Independence Road. McNeil's attack stalled after it had pushed the Confederate rear guard back into Independence. Brigadier General John B. Sanborn's Third Brigade came forward to support McNeil. By 3:00 PM, the Union troops had reached the eastern outskirts of Independence. Sanborn and McNeil now planned a mass attack to drive the Confederates out of Independence. They were able to surround and capture 300 Confederates from Cabell's Brigade and Cabell himself just barely escaped capture. Their attack was successful and drove the Confederates out of Independence. Sanborn and McNeil took care of the dead and wounded. The local bank was used as a Union hospital and the Jones Hotel was used as a Confederate hospital.